As its name suggests, motherwort has a long tradition as a woman’s herb and was used both to calm the mother in childbirth and encourage contractions. Native to much of Europe, the plant has striking foliage and is sometimes grown as a garden ornamental. 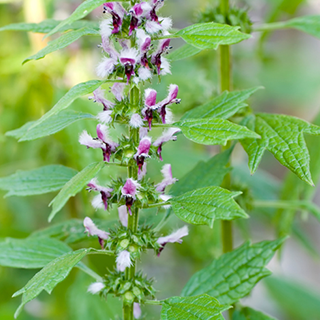 Motherwort brings on delayed menstruation and promotes regularity of the menstrual cycle. It is also used in regulating hyperactive thyroid, treating heart conditions and it is commonly given for palpitations and to improve heart function. Drink 1 cup (1–2 tsp dry herb per cup boiling water) 3 times daily for anxiety, menopausal problems, or heart weakness. Sip the tea flavored with cloves (Syzygium aromaticum) during labor and after childbirth to help restore the womb and reduce the risk of bleeding. Combine with lemon balm and lime flowers and use 2–4 tsp per cup to relieve symptoms of angina pectoris. Take 1 tsp (5ml) 3 times daily for palpitations, menopausal problems such as hot flashes and emotional instability, rapid heartbeat, or PMS. Combine 1 part of the decoction of the dried herb with 2 parts of honey by volume. The syrup has a calming influence and is used for the same purposes at the tincture, but is of marked advantage due to the improved taste. Use as an alternative to the bitter infusion, take 2 x 500mg capsules, 2–3 times daily. Prefers moist but well-drained soil in sun or partial shade. Sow seeds in a cold frame in spring and transplant to their final position when the seedlings are wellestablished; allow 18in (45cm) between plants. Alternatively, propagate by division in spring or autumn. It can self-seed enthusiastically and become invasive. Gather in summer while the plant is flowering. Seeds are harvested at maturity and dried.